The Seattle Repertory Jazz Orchestra (SRJO) is an award-winning, 17-piece big band comprised of many of the region’s leading jazz soloists and band leaders. The SRJO is the Northwest’s only permanent ensemble dedicated to the accurate and historically observant performance of the great works of big band jazz. 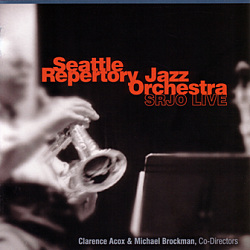 Drummer Clarence Acox, nationally recognized director of bands at Seattle’s Garfield High School, and saxophonist/arranger Michael Brockman, long-time faculty member at the University of Washington School of Music, founded the SRJO in 1995. As early as 1988, however, many of the players had assembled for a now-annual concert of the Sacred Music of Duke Ellington, presented by Seattle’s Earshot Jazz Society. A 1992 “Evening of Ellington” program, presented by Brockman at the University of Washington’s Meany Theater, brought together players not normally included in the sacred concerts, and featured new transcriptions by Brockman of classic Ellingtonia.